I received two emails from organizational leadership in the past week that represent milestones to me. One was about our efforts to better manage populations in the context of risk-bearing (pay-for-value) contracts with our payers: “[Partners] is undergoing a planning process to determine what we can do over the next 3 years (2015 to 2017) to better prepare for increased risk in payer contracts….there is a segment of our Hypertension and Diabetes population (and CHF) that would benefit from telemonitoring.” The language here is not dramatic, but the recognition that patient-generated data can be a critical tool for population health management and improved efficiency of care delivery is something we have strived to demonstrate over the last 10 years or more. It feels good to hear it come from others. The second email came from a senior IT architect: “[The data integration team] are working with the Center for Connected Health to get remote monitoring data into [a scalable, secure database]. From there, the plan is to have the data viewable from, but not necessarily resident in, Epic.” Again, the words are not dramatic in nature, but the recognition, at the highest levels of our IT organization, that it is critical to our future to incorporate patient-integrated data into the care delivery process is a milestone. I blogged a few months back about how we created the platform referenced in the paragraph above, allowing the easy integration of patient-generated data into our core clinical systems. In fact, we are deliberately using this platform to integrate our Patient-Reported Outcome Measures into the system. This will enable us to bring in both patient self-reported data as well as objective, biometric data and eventually perform analytics on these two data sets. Partners HealthCare believes that patient-generated data is critical to our future and we’re managing this integration proactively. That does not mean our work is finished. For example, there is currently a significant overhead in managing remote sensors (BP cuffs, scales, etc.) and home hubs (2Net hub, Alere’s Connect device), and getting them back from patients after the program is complete (all of our Connect programs are time-limited). The overhead of purchasing that gear and managing inventory adds cost to the programs and strains ROI calculations. Why not use what the mobile industry calls BYOD (bring your own device) and software apps on smartphones/tablets? That way, patients who own their own health sensors (so many are available in the consumer space these days) and mobile devices can participate at a much reduced cost to the delivery system. A recent article in Health Data Management (Providers, Payers Get Appy) sheds some light on what other marquee health care organizations (Kaiser, Geisinger, Children’s Hospital and Aetna were featured) are thinking about the issue of integrating patient-generated data. There are some parallels and some differences to the way we’re approaching it at Partners. I should caveat the next section of this post by saying that I only read the piece in HDM and did not talk to any of these folks personally. I do know all of these organizations, and have, in the past, spoken with their leadership about their strategies and continue to learn from each other. So I think my analysis is solid. However, I could be wrong. The biggest difference I see is their belief that patients are already hopping on the bandwagon of buying their own sensors and generating their own data in some sort of massive wave –and that they are all using smartphones and tablets. As the mHealth field was emerging four to five years ago, I went to conferences and listened to all of the enthusiastic entrepreneurs talk about self-tracking, Quantified Self, consumer enthusiasm for buying health tracking devices, etc. For some time I had a rather unsettled feeling because what I heard in the field did not match our experience at CCH. 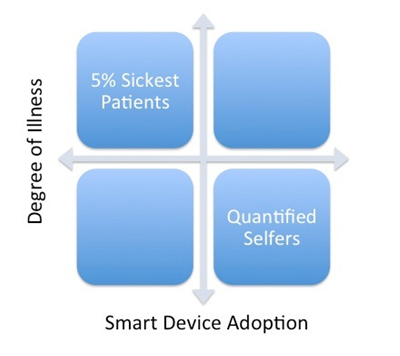 If we plot degree of illness vs. smart device adoption the graph looks something like this. At Partners, the patients we are targeting for connected health programs — to improve care, increase patient self-management and decrease cost — are those sickest five percent — and they are not smart device adopters. The quantified-selfers brimming with smart devices, measuring and monitoring their health and fitness tend not to be folks with chronic illness or patients who drive much utilization of health care dollars. What the organizations featured in the Health Data Management piece have in common is that they are creating mobile apps/platforms to enable patients who already own smartphones and connected devices to share those data. This approach seems less proactive to me, meaning if you have a smart device and one or more connected sensors and want to share your data with these organizations, they’d be happy to have it. If you do not, they’ll manage you the old-fashioned way with office visits, hospitalizations, etc. The advantage of this strategy, as noted above, is that the cost of technology falls on the patient and the organization rides the adoption curve. However, the adoption of these technologies in sicker patients is still low. At some point, the five percent of sickest patients will move from the top left quadrant to the top right quadrant in the graphic above. We’ve started to see this with patients asking us for apps, using their own tablets (thank God for Skyping with grandchildren! ), etc. But there is almost no penetration of connected sensors in this population yet. We’ve made the commitment at Partners to be more proactive in deploying devices and hubs to these patients. We’re also thinking about how to facilitate adoption of smart devices among these patients — maybe offer coupons to facilitate the purchase of their own scales, BP cuffs, etc. Then there is the matter of towing the regulatory line. Many of the devices available at Best Buy or the Apple Store are not FDA approved to be used in treating illness. Many of the smartphone apps out there are also not FDA approved. I’m sure this is one reason Kaiser, Geisinger, et al. are creating their own. At least one firm, iHealth, is going in this direction (their platform is FDA approved and available to consumers), and combining their consumer platform into a care delivery process seems like an intriguing option. Qualcomm is offering the 2Net ‘hub’ as a mobile app. So what are the two roads? One is a proactive approach, using patient-generated data as a core part of population health management and making sure that the sickest patients have the devices to generate objective and self-reported data. The other is perhaps a less aggressive approach, opening the APIs and allowing those with smartphones and connected devices to bring data in. For now, we believe that approach will generate more data from healthy, low-utilization individuals and miss the sickest five percent responsible for 40 to 50 percent of health care costs. At some point the second path will make the most sense as more, sicker individuals will have smart devices and connected sensors. We’re preparing for that world at Partners. When do you think it will arrive? ← The next phase of self-tracking for health – mood trackers? I think you can recall that we used to talk about the ‘worried well’ and that’s where so much of the focus still is. These patients represent the least of our concerns when it comes to transforming health care delivery and saving cost for the system. In a one year study of Medicaid members already previously enrolled in a diabetes disease management program from 2009, enrollment in a telehealth enhancement pilot discovered that less than 5% were willing to share their email address (not clear if they didn’t have one or didn’t want to share it). We did better getting phone #s of course and voice was the primary method of two way communication. In contrast with the original design which relied on text messaging and email for twice weekly feedback to the patients (following remote data collection via a 2net style device we shipped to their home) we had to mail reports and educational messages based on analysis of their data. Needless to say, cost went through the roof due to an increase in labor vs. IT automation. Like your experience, getting these home telehealth devices returned was quite a challenge as well. Unlike the conference powerpoint excitement, detailed time and cost studies around operations can easily double program estimates. At this stage, the technology component is child’s play. Working with patients remotely in an efficient manner is the devil in the details and that knowledge only comes with sometimes painful experience. However, when you execute on this vision, results data show that clinically significant improvements are the norm especially for those high cost patients. One final note, remote monitoring in this same pilot discovered that nearly 40% of those members enrolled in the high cost disease management program (not including the telehealth pilot) were well controlled and probably did not need to be in a high cost program at all. Perhaps this facet of the technology is what makes it clear to payers why they should commit to implementing telehealth programs. The cost savings from disenrolling those 40% represents a massive savings and a line item that needs to be added to anyone’s ROI calculations. Joe, your assessment of why PGHD should be included in the clinical record for chronic disease patients is spot on. Focusing efforts to integrate data from remote monitoring will provide further evidence on the benefits of daily monitoring and education materials for our sickest patients. Excellent blog on a critical topic. Thank you. Beyond clinical and cost-compression objectives, there may be another reason to consider when thinking about opening up IT systems to patient self-reported data– marketing. Whether paid on a fee-for-service basis and hence need volume (in perhaps an ever more “narrow network” world), or needing to build a robust risk-pool, integrating self-reported consumer information from patients who “brought their own devices” may be more important than a spend analysis would suggest, and may need done before the Top-Left Quadrant to Top-Right Quadrant migration. What a great post. Your experience over these past many years with remote patient monitoring is invaluable. We know from your studies the more seamless the monitoring (patients don’t have to upload their data) the more effective results, is paramount. It is exciting that the larger organization now realizes the impact of patient generated health data. The ROI for getting the hubs to the sickest patients is right around the corner. The change in payment paradigm is taking care of this. The labor of delivery and retrieval of patient hubs will more than be paid for when one patient return to the hospital for CHF is not reimbursed. Keep up the good work. Hopefully your work will be built upon by those healthcare systems that have been neglecting the new paradigm of healthcare. Thanks for your encouraging words. The near term future is quite bright. Sounds like real progress. My concern is whether clinicians will actually use patient-generated data. I have seen a lot in the research about how clinicians simply don’t trust patient-generated data and aren’t open to using it. Your thoughts?. As more and more tech natives enter the clinician pool, those for whom health data and digital self-measurement – and our whole digitally-driven world – seem normal, the comfort level they feel with patient-reported data will increase. That patient-generated data may be less trusted now, but I think the “new normal” will begin to take over sooner rather than later. This is an important debate – the ‘acceptability of patient-generated data’. The legitimate concerns of clinicians rest on the notion that consumer devices are not calibrated. For instance, my systolic BP is consistently 15-20 points higher on all of the home cuffs than when its measured by my MD. That is a concern. Most clinicians who use these devices with regularity have one calibration meeting with the patient in the beginning of the program. The second concern is that the MD will be deluged by too many normal or irrelevant readings. of course software algorithms can solve that problem and will. I would be very interested what role ubiquity of internet plays in remote patient monitoring. As public wireless networks expand, and the costs of cellular data service fall, are we going to see more devices that no longer depend on bluetooth, base stations, smartphones or the patient in the middle, rather, communicate in a self-contained manner to the cloud via these networks? One side effect is that the devices are much less expensive, and providers don’t stand to lose much if they are not returned. I see the future you are suggesting, but it is a long way off. cellular data is now heavily metered in the US and even M to M charges are significant. Certainly much more than BlueTooth. While some of the pedometers are almost giveaways, BP cuffs and scales are a long way away from that. Thank you for another great post, Joe. I’ve been following the conversation on PGHD for quite a while. I would like to add that getting the sickest patients to comply is a challenge, not just with data but with medications and other facets of their care. I wonder if these patients, who have so much on their minds already, might be more receptive to PGHD and remote monitoring if they received some sort of benefit or artifact from their data (perhaps a phone call from a clinician or family member when their blood pressure spikes, for instance). Apps can certainly parse the data from FDA approved devices, but the algorithms to analyze and act on the data (i.e, to notify and prompt the aforementioned phone call) have yet to be created, if I’m not mistaken. absolutely right. to be adopted there needs to be something ‘in it’ for them. We have some efforts going on to do the analysis/act on the data. early days, but encouraging results. There is a move afoot to focus intensely on “medical device interoperability”. The West Health Institute is developing software to embed in all devices to accelerate adoption, and hoping I think that everybody will sign off on it. Next week (February 6, 2014) in Washington there is big meeting on this backed by ONC. See http://www.hcidc.org for details. One of the best blog posts I have read in quite some time. The pragmatic approach when embarking on innovation of this type is absolutely the rule of the day. I consult around the country for health systems of all sizes and the one common mistake I encounter is an organization embarking on a mobility or remote health monitoring project before they have a roadmap for success. Many projects are started in the middle of ICD remediation or Epic implementations without regard to the rest of the IT ecosystem. One suggestion for any organization considering any project as described is get your house in order while creating your remote health monitoring roadmap. Have a data management program which is mature and based on solid BPM strategy to support the roadmap. Know what you have throughout your entire IT inventory and what the costs involved in maintaining that inventory YoY. And most important do not attempt to to add more levels of integration through decades old interface engines. Before any IT department allows for another layer of patient centered technology to be added decouple your environment, convert as much as possible to services, jettison older applications, continue to consolidate and most important take your lead from folks Joe, Kevin, and Alice! I appreciate your words of encouragement! Joe, this is a great post and terrific graphic of the approaches/users. I’m thinking there’s another way to consider the dichotomy of adoption and use. Those who are in the lower quadrant will contain some folks who could become one of the “sickest,” by way of accident or discovery of a currently-not-known condition. Therefore, the QS folks are the early adopters and also the most likely to share the data for the common good. This can lead to the development of sharing hubs and open enhancement, the latter meeting your well-defined need of scrubbing the data to reduce noise. The Sickest can be the models for interaction with new devices (new to them), teaching us the roadblocks to increasing the numbers of QS and QCC (quantified chronic conditions) so that we can all learn. 1. from the QS: can we leverage their enthusiasm to be our evangelists in wiring more folks? What will be the roadblocks? How will we overcome the expansion challenges? 2. from the Sickest: can we develop training to more rapidly help them AND their clinicians to see the value of quantification (ask Stephen Wilkins more on this movement to create communication that matters)? Can we sequence the challenges to speed adoption and perhaps better outcomes in these folks? Can their caregivers and family members (particularly if these 2 are different) be the proxy user for the lack of engagement by the Sickest? Thank you, Cyndy for these thoughtful comments! Well said. We’ve had a Patient Provided Information tool integrated into our EMR at Mayo for 19 years. It initially provided pre-visit information, now provides pre visit information, meaningful use information, ongoing disease monitoring/outcomes for conditions like asthma and depression. Data is captured in elemental form, like tobacco use status, allergies, etc for direct entry into the EMR and “smart systems”. It can be completed on paper, telephonically, and directly online. We’ve had many “learning” experiences over the years. I believe you are right on target that this will be an ongoing, incremental process of old fashion patient interactive input with gradually increasing input from smart devices. I appreciate your nuanced thought, Phil. Medical device connectivity is a cornerstone of digital care. Great insights Joe. The chronically ill, and the insurance companies/payers that serve them, stand to gain the most from self-monitoring & tele-monitoring. The utilization of versatile smart devices is definitely the logical route going forward… insurance companies deploying individual meters/monitors to patients is too burdensome on ROI (at least in this stage of the game). Diabetes is probably the chronic disease where tele-monitoring is most needed and applicable, and I think iHealth is headed in the right direction in their dealing with the FDA/their care delivery functionality. But I also think they’re fighting an uphill battle because it again requires insurance companies/payers to promote and deploy a new BG monitor. Glooko is another company in the space and we actually have a mobile app & hardware that connects with dozens of blood glucose meters already on the market (AccuCheck, One Touch, ReliOn, etc.). The Glooko system then puts this data into cloud servers and allows remote monitoring and EHR integration. I think this is a smart move… make today’s diabetes management system more efficient rather than trying to deploy a whole new set of devices. Hi Joe, very interesting , informative and timely article as I just became one of those consumers of sensor devices that track activity level–a wrist band. I started using it to track my activity level or fuel during sleep. I agree using technology driven apps and telemedicine to facilitate care of complex medical problems may improve quality care by providing more reliable data for providers. Given over 55% of health outcomes are determined in the community the science, supports this shift. Moreover, I think it will promote health and health literacy. On the other hand, I strongly believe content of all EHRs belongs to patients. Opening the API to allow smartphones and other sensors to bring patient-generated data into their EHR is the future, paving the way for transparency. Patients want options and both strategies provide exactly that. Finally, those healthy patients using sensors are proactive. They are the new look of technology driven health prevention and promotion. Thank you, this was an execellent article. I agree completely with all of your comments! Dr. Kvedar, Thank you and Partners for not only being prescient, but helping other organizations through your Center For Connected Health. Having attended your events, it’s a great opportunity to see some of the early adopters great work. At Axial, we believe that patient-generated data is the key to managing chronic disease, and the huge uptake in smart phones is the most important element–whether or not a patient uses wearable trackers or not, there is plenty of important information. We collect patient generated data for our health system customers and find that coherent, searchable, self-generated data is growing so rapidly as to amaze us. And yet, we still have to convince most health organizations that it is important. The phrase we hear is “the patient is the last mile”, reflecting the current national belief that the hospital is the epicenter of healthcare. We believe the patient is the FIRST mile. See our blog about your column. I concur about the confusion of the first mile/last mile. Great discussion as always. I think the inclusion of patient reported data is critical in population health. Your 2×2 grid point to the question I ask every mHealth company that pitches me. I’ll be interested to see what happens in a new program we’re getting ready to do. The client is giving and FDA approved diabetes device to diabetics along with free supplies as long as they provide the data stream to the plan. We’re going to pull in that data and write rules against it in our business rules engine. That will provide triggers for nurse engagement and follow-up calls. Ideally, we’ll be able to compare this data set to others to see how this links to clinical and financial outcomes. More to come. Thanks, George. Please do keep me up to date on how this goes. The theme of trading privacy for something like free supplies or a reduced premium is one that I expect to see more of. As others have intimated, congratulations and thank you for is excellent blog — simply SPOT ON, as always! I’d suggest we consider the term “person” versus “patient”. Patient-centric is a big step forward with respect to our traditional silo-ed HIT systems. However, it isn’t the necessary ending place, or frankly the place to be. We can and must do better. The traditional provider systems [and culture too] have viewed their place in the world as the center of the universe, with patients coming and going within the system. The future will hold the PERSON as the center of the universe, with their data coming and going within different providers. There’s nothing that keeps this from happening today, other than inertia in culture and payment incentives. But that is changing, thanks to thought leadership along the lines you’re outlining and are practicing / providing. There are considerations, of course. For example, that data must be shared on an exception, rules-based fashion. Also, financial incentives must be changed to align with this view of effective, continuity of HEALTHcare, versus episodic, expensive sick care. With more and more such incentives in place, and ever-increasing alignments, I hope we’ll be able to refer to patients as people, and use their data to keep them away from providers for as long as possible — healthy, well and happy — to interact with the system most efficiently and effectively. When providers are incentivized to accomplish this, we’ll all appear as people to the system, not just patients. Thank you for leading us there, Joe! The Doctor Weighs InTwo Strategies for the Integration of Patient-Generated Data into the EMR. Which Road to Travel?